The price of a barrel of crude oil hit $54.51 Monday, the highest level yet in 2016. It sounds as if the world's epic oil glut will finally come to an end after OPEC finally agreed to cut production in November. Even Russia, Mexico, Oman and Kazakhstan -- non-OPEC countries -- are now saying they will scale back as well. There's a "feeling of euphoria" in oil markets, says billionaire Harold Hamm, the CEO of Continental Resources. But here's the catch: History shows that OPEC -- led by Saudi Arabia -- almost always cheats on its oil deals. "OPEC (countries) never holds to their deals. They always cheat," says John La Forge, head of Real Asset Strategy at Wells Fargo. That OPEC deal to slash production to just 32.5 million barrels a day almost certainly won't hold, predicts La Forge. 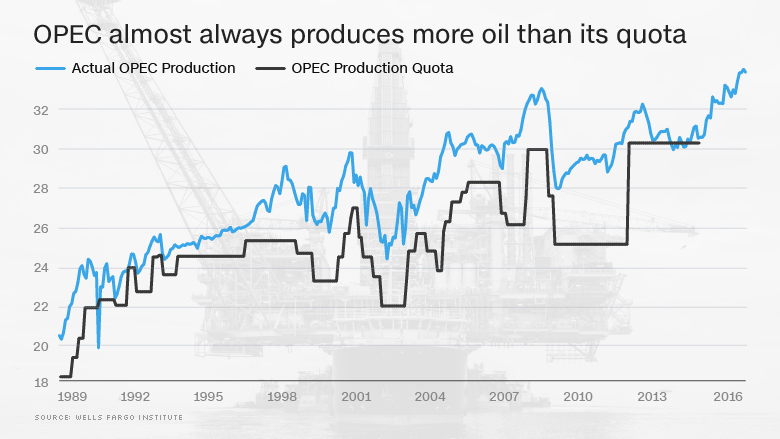 Since 1989, OPEC has hammered out numerous production cuts just like the one it just negotiated in November. But in that nearly two decade period, OPEC has always produced more oil than the quota in all but a handful of months. "The higher price goes from here, the more they will be inclined to cheat," says La Forge. It's just basic economics. When OPEC announces these deals, oil prices typically rise. The higher prices go, the more producers around the world are eager to get pumping again. Another key factor that will surely get in the way of getting in the way of reducing the oil glut is the United States. It has re-emerged as a global energy powerhouse thanks to an abundance of shale oil in the U.S. 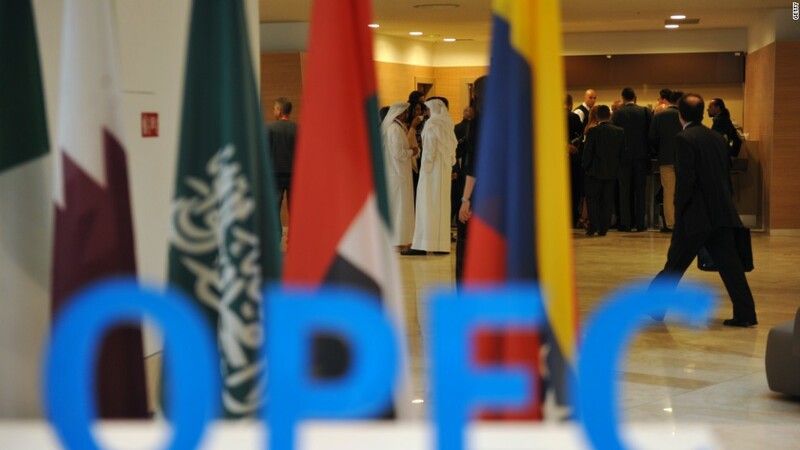 The U.S. is not part of the OPEC. It didn't sign this latest production cut deal. In fact, president-elect Donald Trump wants to see the U.S. pump even more oil. In the past few years, every time oil prices have returned to close to $60 a barrel, the rig count soars in the U.S. (and elsewhere), says La Forge. That, in turn, pushes prices back down. La Forge foresees oil staying within the $40 to $60 range for a long time. His views are very different from those in the Middle East where many are counting on rising oil prices to boost their local economies. "There is optimism in the market that finally the oil glut will soon dissipate," said Ali Hamoudi, CEO of Adaa Financial Services in Dubai.